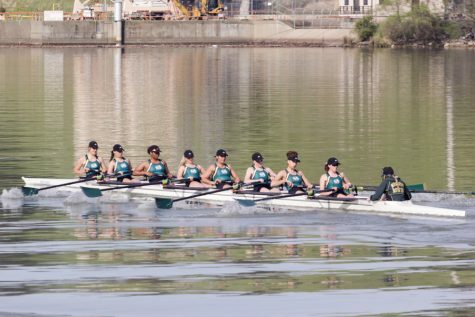 Sacramento State rowing varsity-four team, right, races against Gonzaga, left, Alabama and the University of San Diego during the Lake Natoma Invitational on Sunday, April 15, 2018. 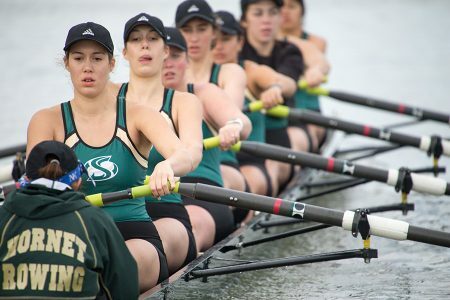 Sac State finished third in event 20. 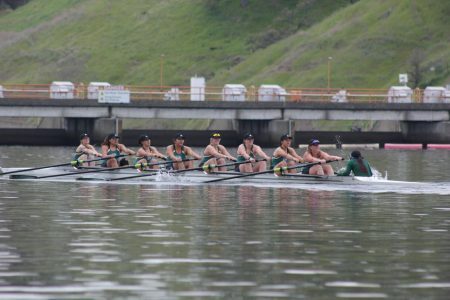 The Sacramento State rowing team took third place in all three races to conclude the two-day Lake Natoma Invitational racing event on Sunday. 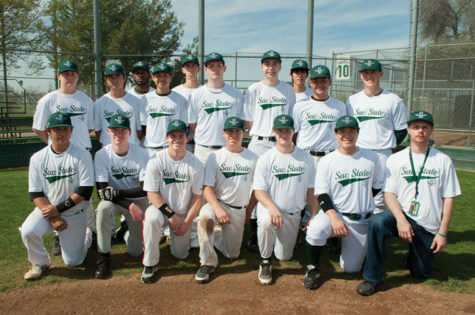 The invitational consisted of teams from all over the nation including Stanford, Brown, Cal — which all rank top 10 in the nation — Gonzaga, Alabama, the University of San Diego and Notre Dame. Senior and team captain Elena Galvez said that the high competition was good for the team overall. 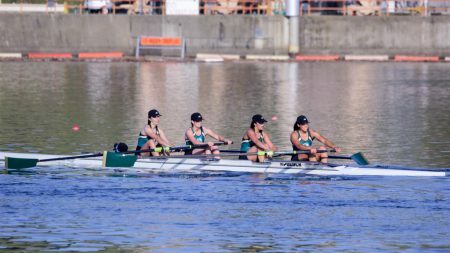 “Some of the crews we raced against are some of the best in the nation, so it was great practice for us to be intense and competitive and kinda push the bar,” said Galvez after the races. 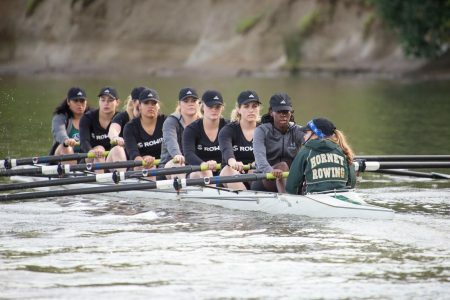 Sac State coach Mike Connors said he thought that the team underperformed in the races and mentioned that other teams looked like they had more fight than his crews. “They just looked like they wanted it more and in a one-seat race, that’s what it all comes down to,” Connors said. The race he is referencing is the top boat on the variety-eight team. They placed third in their race, just three-tenths of a second behind Alabama’s boat. “It’s that level up, getting out of our heads, getting out of our fatigue and just relaxing and going that I think he wants us to get,” said Galvez in response to Connors’ comments. 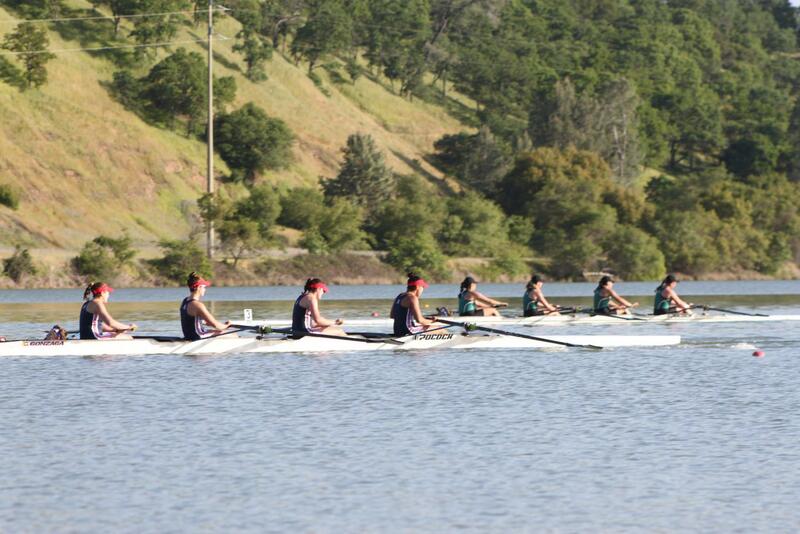 The second varsity-eight boat also finished third in its event. 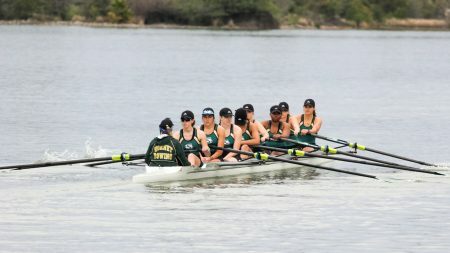 Junior transfer Abigail Morgan raced in seat five of the boat and said that she thinks the rowers rose to the level of competition they were up against. 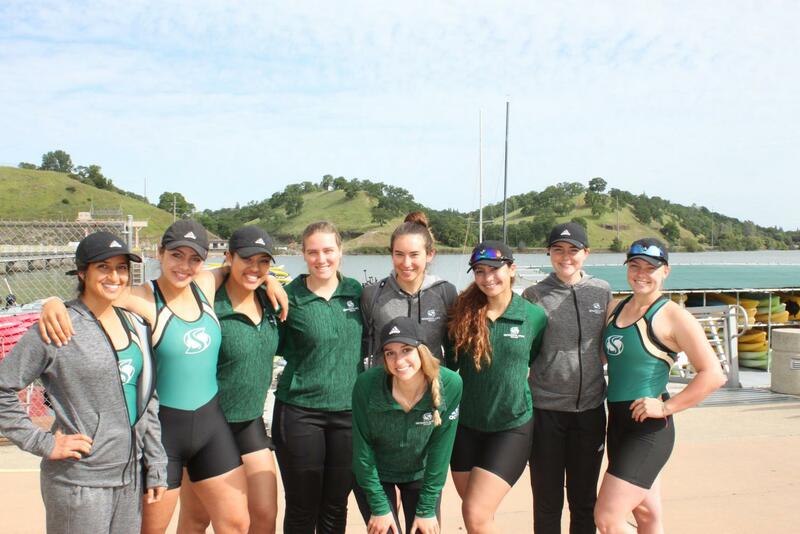 Sacramento State rowing’s second varsity eight-team poses for a photo after the Lake Natoma Invitational on Sunday, April 15, 2018. They finished third in event 22 with a 7:17.3 finish behind Alabama (7:03.6) and Gonzaga (7:04.1). 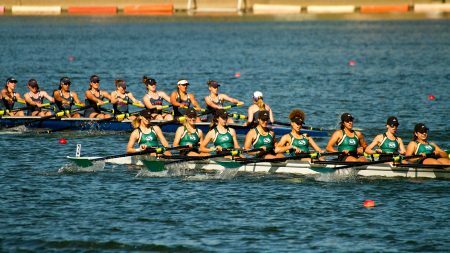 Two weeks from now, Sac State will be hosting the Western Intercollegiate Rowing Association Championships at Lake Natoma on April 28-29. Galvez said that she doesn’t want her team to lose sight of why they’re here. As a team she said she wants them to work on keeping the intensity up and the motivation to finish the season strong. “Not forgetting why we’re here, not forgetting that we’re here to empower and uplift each other and make each other go fast,” Galvez said.